May Day: The May Snippet, & The Untold Contest! The time has come, my friends, to talk of many things: snippets of suffering, and the giveaway of four advance copies of Untold! Kami heard the creak of the front door opening, and instantly afterward the loud sound of her father’s voice. He sounded furious in the same frightening way he had before. “Yes,” Mum said again, desperately. Kami could see their shadows, black against the yellow wall, and how far apart they stood. They went into the kitchen. Kami heard the clatter of their movement, the absence of noise that was their furious silence. Her hand was still locked around the banister, gripping the wood as if there might be some comfort there. As if wood and stone were what her home was made of. She thought of Aurimere House, where Angela had said people were going to Lillian, where there might be answers. Angela had said Jared was there too. No. She wasn’t going to do it. She was going to go back to bed and sleep, and in the morning she would be in control of herself. In the morning she would fix this. So what must one do to win all this suffering? So. Four books. Four challenges. No waiting. 1. Art Challenge. Drawing, manipped photo, tumblr gif with hilarious words on, anything Unspoken-related visual and artistic, and I shall give the most artistic artiste a prize! 2. Words Challenge. Song, poem, story: anything Unspoken-related under a thousand words. We wordsmiths must stick together. I will post the books to anywhere in the world. The contest will end at the end of this beauteous month of May. Just put links to your entries in the comments to this blog post, or its mirror on livejournal. I am looking forward to seeing what you guys come up with! I’d like to enter this into the art category please. THIS SNIPPET. THIS BOOK. I WILL NOT SURVIVE. Neither can I deal with your beautimous covers. Here’s my first entry in the contest! I hope you like it, even if it doesn’t win. I’ve been meaning to make more Unspoken graphics for a while! Quick question are Words Challenge! Regarding stories, is that…fanfiction? Should I write some kind of quick release (“this stories author disavows any inspiration for….blah blah”) to prevent legal shenanigans? Hey Sarah! Are we allowed to enter more than once? My first entry to anything like this..ever. Yikes. Anyways, I WAS going to do full faces, but then I came to the conclusion that I am terrible at drawing anything below the eyes- so I skipped that part all together! 🙂 Anyways, in order it is: Kami, Jared, & Ash. In for a penny in for a pound. Can I enter this into category 4? I know I made it a while ago but every little counts right? Here’s the link to my entry for the words challenge! Hmm, not sure my first comment entry went through sooo here’s my art entry! I have more but I seem to have misplaced the links. SOON. I’ll attach it here as well. Boy, oh boy, oh boy, oh boy, oh boy. My ‘Surprise Me’ challenge! This is the first entry of many more (I dearly hope)! Second entry! This time for the Picture challenge. to be able to win a book, are we supposed participate in every challenge (art, words, picture, surprise) or is it up to us (well, it does increases the chancesm i hope) to decide how many challenges we want to tackle (including the number of times we participate in one such challenge)? second question, are there any criteria we have to meet (other than it being unspoken-related in some way, that is) so as not to get disqualified? sorry, for this long comment, but it would really set my mind on ease to know these things. It’s up to you guys, but of course every entry = more chance of winning, by virtue of numbers! And no, no criteria but being Unspoken-y. Don’t be worried… and thank you for your awesome entries! My second entry! 🙂 Hope you like this one too! I couldn’t pass the chance to have Untold between my hands before September, 24th… so here’s my entry. Thanks a lot for this contest, Sarah! this one wasn’t supposed to be posted twice. sorry ’bout that … please feel free to delete it! I attempted to comment on your LJ, but apparently it got eaten by the spam filter. Sorry if you get this twice! looking at her so strangely, and her pink sweater is itchy, and hot. came from, or whether or not it was real. freezing, she could feel it in her heart. the voice came from, so she didn’t know how to share her sweater. Where are you? I need to know where you are. cold. And the floor is hard. Oh, it’s s-so cold. goodness of the yellow cakes they seem to call, pancakes. What’s your name? Asked Kami. people call me, and they say it kind of funny too. an answer came. Jared, my name is Jared. somewhere, alone, hungry, and cold? This is a little something I just came up with. It is Kami and Jared’s very first conversation. I would have drawn some photos, but it’s been a long time since I’ve read this book, and I just found out aout this contest today. And most of my books come from the library, and since I live out of town, I can only visit the library on Saturdays-next Saturday is June 1st. Anyway, I hope you like it, and have a nice day. I’m working on my entry, I hope I finish it on time! I wanted to know until when can I send it, and what time zone you’re using. Thanks!! Here’s my entry to the words challenge! I wrote a 100-word drabble, which was immensely fun. Hope you like it! Here’s our first entry!!!! It’s for the picture category. Here’s the link to our blog. I just read this today and finished it today! Glad I found out about this in time.. I’d have been mad at myself. Digital illustration of Kami. Here’s my entry for the words challenge. Thank you! Here is my entry for the contest! Things got a little wild when the librarians at Westerville Public Library all wanted to read Unspoken! my entry for the art challenge! http://porotto.tumblr.com/post/51797292406/she-was-losing-hold-of-everything-it-was-all I hope you like it! 2nd (and last) Entry for Words Challenge. I wrote this 497 words flash-fic on the train going to work. 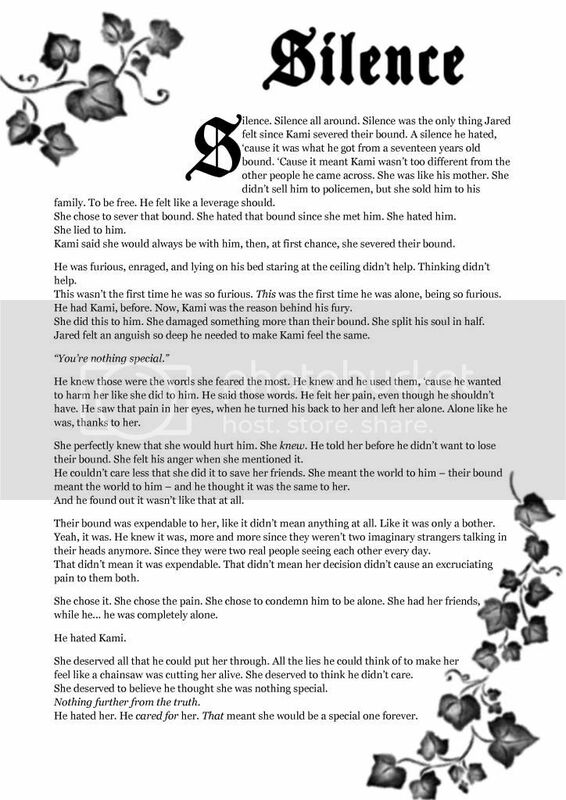 I’m really impatient to know what happened next, and I’m really impatient to know what Jared was thinking while saying “you’re nothing special” to Kami. I know you said you’re going to write your canon of that scene, but, for the moment, that’s my version. Thanks again for the chance to win the Untold ARC copy. Entering in last minute, in surprise me category. Here’s my first entry for the Words Challenge. Here’s my second entry for the Words Challenge. Sorry, this one’s a bit long. Still less than 1000 words though, so we’re good. Here’s my entry for the words challenge: a song I wrote and recorded, titled Unsaid. 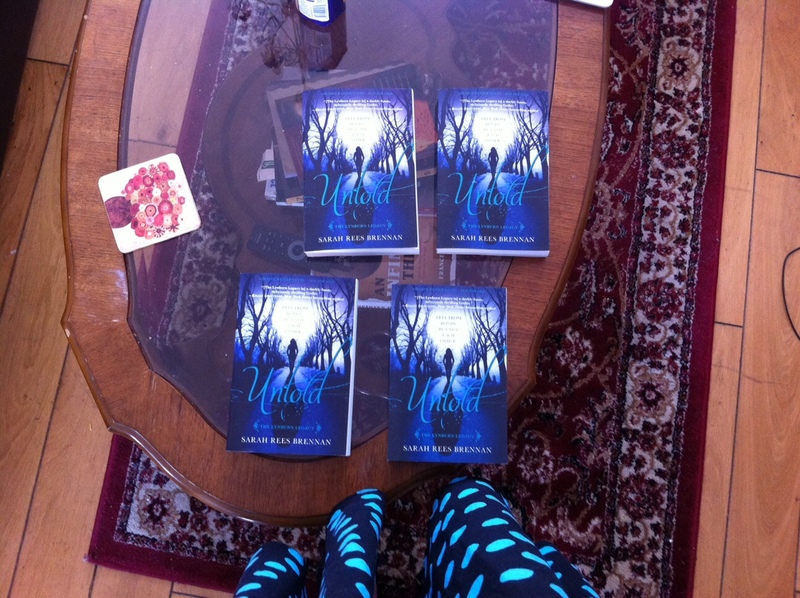 YA AUTHOR BRENNAN GOES BATTY AT PUB WITH A BREW! Apparently at some point midway through her author talk, and without any warning, Ms. Brennan snapped and tried to choke an audience member in the front row with the very penny necklace the member was wearing after she offered Ms. Brennan leftover airplane food from her purse when she heard Ms. Brennan was feeling “puckish”. Ms. Brennan was quickly escorted from the Pub while the remaining guests all ran screaming into the night. Sorry-In-The-Vale regulars who stayed behind and returned to their pints swore Ms. Brennan was still screaming “PEANUTS! YOU GAVE ME PEANUTS? WHERE ARE MY BISCUITS?” as she was quickly hustled into the Delorean by her entourage. a picture last Tuesday of her desecrating the graveyard by, lounging against Lynburn tombstones while reading a copy of Ms. Brennan’s UNSPOKEN in a blatant attempt at fandom. The Vale’s Sergeant Kenn announced he will plan, “unannounced patrols of the graveyard until this suspected graveyard-desecrating suspect tourist is found and questioned right proper”. We made this orange bra, just like kami had, just for you! We thought it could be in either the art category or the surprises me, so we left it for you to decide. wondering the same. i thought with end of may the winners would be announced.